This version of the Safariland SLS System holster features the patented rotating hood and tensioning device for increased weapon retention, yet still affords ease of draw and quick, secure reholstering. The Safariland 6285 Retention Level II Duty Holsters provide the optimum combination of safety and performance for police officers and others who carry handguns in tactical situations. 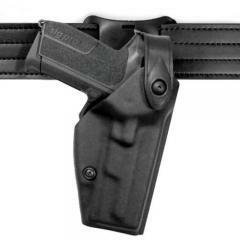 The Safariland 6285 is a 1.5" belt drop, top draw, straight cant holster. Manufactured of long-lasting Safari-Laminate and lined with suede to protect your gun's finish. For additional security, these options are available for the Safariland 6285. Excellent holster recommending it to all my law enforcement friends. The 6285 is great. It fits my XD Mod 2 like a glove and without any modifications. Great holster, fits and feels good. Quality holster, but a tight fit with the stream light x300 flashlight. This is a low ride duty holster. You can select 'Glock 21' as the gun fit. Will this holster work with a Sig P250 compact Long Slide? You will need to select the full size P250 to fit the long slide version. Yes, you will need to select 'Sig Sauer P229R DASA (3.9" bbl)' for your gun.